Michael Gordon Peterson is the kind of guy that begs to have his story told, no matter how loosely or non-factual. Known as Britain’s most violent criminal, as well as by the alias Charlie Bronson based after the actor, he was sentenced to seven years in prison for armed robbery of a post office. Thus far, he has spent thirty-four years incarcerated—thirty of which were in solitary confinement. Nicolas Winding Refn’s Bronson depicts this intense creature made up of pure aggression, portraying his insanity and strange sort of odd compassion. All that time in jail and he never even killed a person, although he did come close at least once. 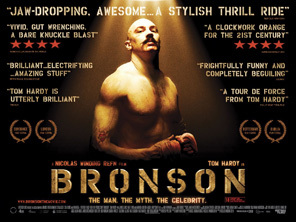 Instead, Bronson stages kidnappings of guards in order to draw in more to fight, finds himself locked in a drug-induced stupor at a mental institution, warring underground in an illegal boxing ring, as well as performing a vaudeville act of his life to an audience that exists only in his head. The film is highly entertaining in its orchestration, allowing star Tom Hardy to give a performance that can only be described as tour de force. For a film that appears to have every making for a somewhat boring construction—how many times can we really watch a man provoke, beat up, and get beaten before wondering if anything new will happen—Hardy never allows it to reach that point. On screen for the entire duration, Bronson’s portrayal is magical in the sense that this man is high-energy spitfire his whole life. Even in the fantasy stage world of his mind, he will erupt with rage when the audience’s reaction isn’t what he desires. Never afraid to show his theatrical chops, Bronson paints his face for comedy, reenacting moments between himself and a hospital doctor by dressing up each profile as one or the other, as well as stare at the camera in pitch-blackness, his body illuminated in order to tell us his story in monologue. And through it all, the one constant is the creepily ecstatic smile that forms on his face when he recalls the happy memories of violence and rage. Peterson always wanted to be famous—a celebrity. With a childhood full of fighting and abuse, one instance shown as he manhandles a teacher at the age of thirteen, throwing a desk on top of his prone body lying on the ground for good measure, everyone knows he’ll end up more infamous than anything else. His mother is completely oblivious to his obvious mental break, coddling him and never listening to the authorities that regularly bring him home. He eventually marries and has a child, but it is more a convenience than a union of love. While she takes care of the baby, he is in the other room sawing the barrel of his shotgun, readying for the crime that finally puts him behind bars, giving that first taste of home he so loves. Jail is not cruel and unusual for him, no, it is a hotel room for which he may hone his skills and improve his weapons. No matter how cramped or small the cell, he finds a way to workout and get stronger, mentally practicing the moves that Charles Bronson makes in the movies. It is all practice for when he feels the need for a little enjoyment; talking back to the guards, holding them hostage, or just being plain belligerent and uncooperative, he never has trouble finding a sparring partner inside. I really have no idea how much of what’s depicted is actually true, but it doesn’t really matter. Some incidents are so obscene and crazy that their relevance to fact is of little importance when compared to the entertainment value of it all. Who doesn’t want to see this violent sociopath serve tea, all proper-like, to a jail guard and an effeminate inmate? Or watch him fight in his boxing ring, pummeling his opponents and then turning to face the crowd with smiles and hands raised while the other guy gets up to hit him? He is a child playing a game and loving every single minute of it. It doesn’t take much to spark his temper, nor does the prospect of freedom make him want to be a model citizen. He attempts to kill a man in the insane asylum so that he could be put back in prison. Bronson revels in this world of darkness and solitude as a battleground to escape from his own mind. He is a criminal that has done nothing but cause mayhem and loss of money to the government, yet his cultural figure shines bright. Becoming an artist inside, his creative outlet just breeds more violence, no matter the fact he has had works published in real life, even winning awards. Again, though, the story alone wouldn’t make a great film, that success lies in the hands of Hardy and Winding Refn. Right from the opening, the movie shows that it won’t be your usual biography piece. In a scene of pure aggression, we see a bloodied Bronson pacing in his cell in close-up, practicing his jabs, and waiting for the guards he knows are coming. With music blaring on the soundtrack, the assault begins as we see him battle four men on his own, smiling the entire time, before the film title stamps in frame, transporting us back for Hardy to explain how it all began. Bronson is a very beautifully shot work, despite its hellish subject matter, always using interesting camera angles and tricks, delineating each environment depicted, whether the outside world, jail, the hospital, or his mind, both inner-monologue and stage show. And Hardy is absolutely brilliant as this madman wreaking havoc. He is so likeable charismatically that you begin to want to see him beat the next man to a pulp, if only to hear his account or reasoning or just to see that mustached grin light up his crazed face. Naked for much of the film, painted up for some, and insanely manic for the duration, Hardy throws himself into the role completely, crafting this caricature of a very sick man. But then, who knows? Maybe the character is more like the real person than we’d want to believe. 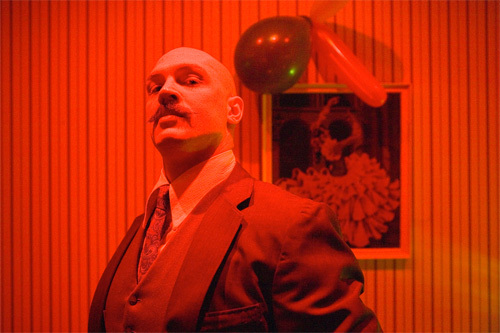 [1 & 2] Tom Hardy in BRONSON, a Magnet Release. Photo courtesy of Magnet Releasing.